I’m taking a break from the dating blogs — and taking a break from dating (my dinner with the #basicbitch broke me) — and getting back to writing about movies, which was the point of this blog in the first place. And I’m just in time for this year’s New York Film Festival, which I’ve attended twice in the past week to view the new offerings from a couple of major American filmmakers: Steven Spielberg and Michael Moore. On the surface, they could hardly seem more different if they were mismatched partners in a buddy-cop movie. One’s fat, the other’s skinny. One’s a documentarian, the other’s a narrative storyteller. One’s a wild-eyed liberal, the other’s Michael Moore. Okay, maybe they’re not so different after all. Tom Hanks confirm his status as a National Treasure with his profoundly likable performance as James Donovan, the insurance lawyer (and most appealing attorney in movie history since Gregory Peck’s Atticus Finch) who defended accused Soviet spy Rudolf Abel, played by virtuouso stage actor Mark Rylance in a miracle of understatement that should finally make him a movie star — or if this doesn’t, maybe his title role in Spielberg’s next film, an adaptation of Roald Dahl’s The BFG, will. 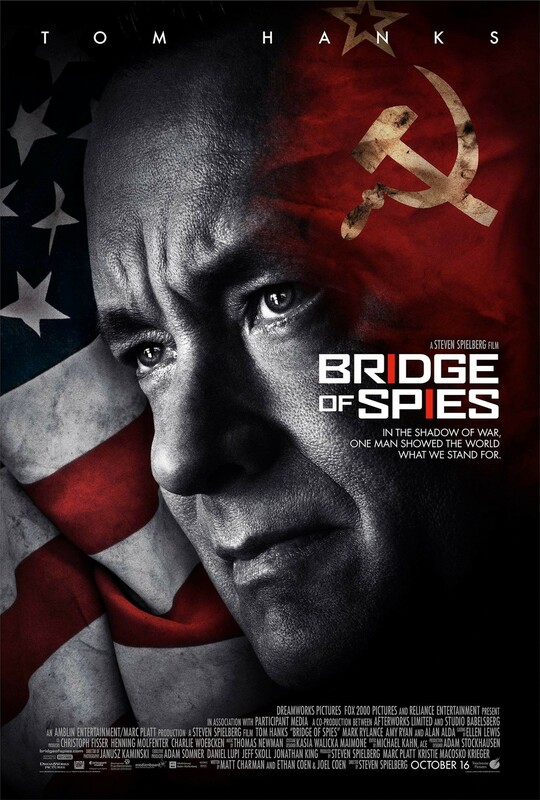 This is a movie that will make you nostalgic for the Cold War, when we knew who the enemy was (the Russkies) but could negotiate with them like relative gentlemen, which is exactly what Hanks’ Donovan does once Abel becomes a pawn in the international chess game that took place after the USSR shot down U2 pilot Francis Gary Powers (Austin Stowell). Donovan’s and by extension Spielberg’s (and by further extension screenwriters Joel and Ethan Coen’s) belief that every accused criminal deserves a vigorous defense, not to mention due process, shines like one of the beacons the director uses in his trademark lens-flare shots. In an era when even an allegedly socialist president can’t shut down Guantanamo, Bridge of Spies reminds us true patriotism has little or nothing to do with the Patriot Act’s assault on civil liberties. That’s surely a sentiment with which Moore would concur. While it’s good to hear his voice again for the first time in more than five years, I’m disappointed to report his latest film, Where to Invade Next, isn’t one of his best. The title is a bit misleading. One might expect a searing indictment of the nation’s interventionist foreign policy, but instead Moore’s in a softer mode (is he reluctant to criticize an ostensibly liberal administration directly?). He “invades” a bunch of foreign countries — most of them in Europe, because as he explained at the Film Festival Q&A, he was working with one-third of his usual budget — and lays claim to their best ideas (e.g. gourmet school lunches in France). The somewhat strained conceit is that Moore will bring these ideas back to the U.S., only to discover they all have their roots in original American ideals. It’s entertaining enough but ultimately slight. One yearns for the angry Moore of Fahrenheit 9/11, Bowling for Columbine and Roger & Me. Instead he’s become a big, curmudgeonly teddy bear. If you’re looking to have the cockles of your left-wing heart warmed, you’d be better off crossing over to Bridge of Spies. « Is There a Spider-Man Curse?